How can Riot rescue the game's most thankless role? Riot has continually struggled to make supports appealing to the League of Legends community. While patch 6.13 improved the overall player experience and quality of life, it failed to deliver the community appeal the role has severely lacked. Significantly fewer players want to play support, and it’s an area Riot is keen to fix. Last week Riot WizardCrab announced that 10 support champions would be added to the free rotation for four weeks. This was done to give players access to a broader pool of supports and improve queue times. However, this is only a temporary fix and Riot is looking to make some big changes to the role in 2017. 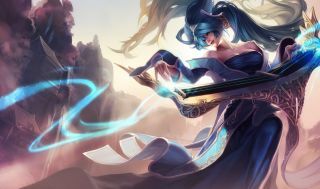 League's latest character isn't a support, but she does offer some fascinating counterplay opportunities. One of the key areas being investigated is how much gold income supports should receive. Supports currently earn the least gold in the game and Riot need to decide whether they want to more closely match their income with other roles. Choosing to up their wages would give support champions a lot more influence over the course of the game, while allowing them to hit their power spikes that much earlier. However, you can’t just increase the passive gold gained by support items as you’ll end up giving solo laners opportunities to create new strategies that could potentially upset the balance of the game. If supports scaled off something entirely different than AP and AD this could potentially allow the role to feel more refined, while avoiding the potential pitfalls that come with increasing gold income. Supports should scale in utility not damage, and the items could reflect this by offering stronger tank stats, CDR, movement speed, gold per second and HP/mana regen. Breaking away from AP and AD would give support champions better shields, heals and CC, but they would still not be able to 1v1 enemy champions. A support's job is to look after the team by providing defensive shields, health top ups, vision and lockdown. A change to supportive items could add further opportunities for supports to shine, while also making the role unique. Players may even be drawn toward the role if these items are only usable when playing support. The next thing Riot wants to work on is the amount of recognition supports get. Their impact on the game isn’t celebrated as obviously as a killstreak, for example. However, it should be made clear when a support makes a good play. Damage dealers get recognition from their killing sprees/multi-kills, KDAs/CS numbers, tracking of damage dealt and so on. Supports don’t have this luxury. Their achievements have lower visibility and offer little satisfaction to the player. Making an awesome clutch save, countering an ultimate or stunning an entire enemy team with a Sona ult can feel great, but it offers little in terms of recognition. Some might argue that ally recognition is all that matters when playing any role, but this doesn’t help supports track their overall performance in-game. Additional post-game statistics would greatly solve this problem. It would be great to keep track of how much damage was shielded, number of wards placed/cleared and the percentage of healing done throughout the game. Even knowing how many kills you denied would make for a satisfactory addition. It may not provide the same instant recognition as the booming pentakill announcement, but it puts their plays firmly in the sights of both teams. Riot started to address support itemisation in the preseason, but in the future they want to make sure the items are compelling enough that players want to pick support items for specific situations, instead of limiting their build paths. Support players also need to feel that they’re getting stronger as they purchase new items. When an AD-Carry or an assassin purchases their third item there is a big spike in performance. When a support purchases their third item it’s really hard to see a noticeable difference. Sure, you gain a little boost to your stats and you may even get an active to help out your team, but the overall leap between items could be improved. Sightstone is another area that Riot wants to consider looking into. If you’re playing support your first purchase is commonly going to be a Sightstone. Purchasing this item instantly puts your build behind for the entire game and greatly limits your choices as a support player. In order to fix this there would likely need to be another overhaul to the vision system. However, this could be solved by giving supports more starting items that provide different options without punishing players for not picking one item over the other. Being forced into purchasing a Sightstone can feel rather unfair and does not help to create meaningful choices. Many players feel that the experience and gold per 10 runes don’t provide enough benefits when compared to damage dealer runes. Supports should have their own set of runes that are only available to their role which focus on providing them with what they need. The introduction of healing and shielding runes would help supports excel in their individual areas and create more strategy within the position. Lastly, Riot is looking at how they can improve the in-game decisions made by players in the support role. Many players pick mage champions when they go support as it gives them a more engaging playstyle that allows them to harass the enemy, push lanes and even transition into an AP carry if they get ahead. It’s really not hard to see why people go down this route, but it’s sad to see so many dedicated support champs dropped in favour of mage champions. Many complain that the role offers little outside of healing, blocking damage and warding. Whether you like the role or not, supports are an integral part of League of Legends. While their playstyle isn’t going to suit the majority of players, they do offer rewarding experiences that are often overshadowed by their bloodthirsty allies. The more that Riot can do to make them more rewarding to play, the better.